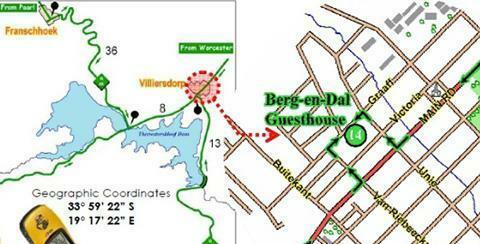 You will find us in the picturesque town of Villiersdorp near Theewaterskloof Dam. Our accommodation is conveniently situated central to all amenities and in reach of various beautiful sights, amongst others the well known town of Franschhoek. The spacious en-suite bedrooms provide for a comfortable and enjoyable stay at the Berg en Dal Guesthouse. Two rooms have their own entrances for extra privacy. There is so much to see and do in and around Villiersdorp from golfing to water sports to museums to art galleries. Berg en Dal is in a central location making it very convenient.